These are the days of guys and bruises. 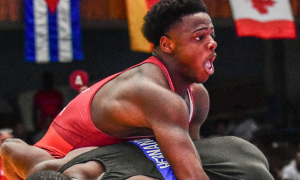 A hefty delegation of United States Greco-Roman athletes, mostly comprised of Seniors with a few Juniors sprinkled in, have been in Denmark for over a week pushing their bodies (and their brains) to maximum capacity. It started with the 2019 Thor Masters Invitational last weekend. The Nordic system tournament provided each and every American competitor with at least two matches, while those who managed to earn wins piled on more than that. Bronze medalist G’Angelo Hancock (97 kg, Sunkist, world no. 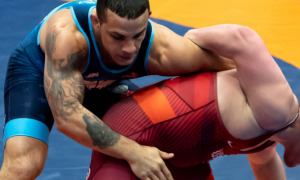 3) and Patrick Smith (77 kg, Minnesota Storm) both engaged in five bouts, while Sammy Jones (63 kg, NYAC/OTS), Jesse Porter (77 kg, NYAC/OTS), and Patrick Martinez (87 kg, NYAC) each walked away with four. But after the event ended last Saturday, the US athletes have been hard at work in a large international training camp hosted by Brydeklubben Thor in Nykøbing Falster. If you’re at all familiar with the sport and this platform in particular, you know the drill: plenty of experienced, tough training partners, and more often than not, lots and lots of live wrestling. 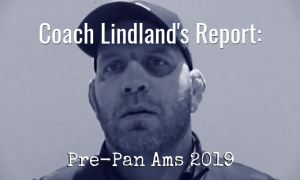 US National Team head coach Matt Lindland, who provided all of the photos below, is pleased with the results from the first week of camp (which wraps on Tuesday) and has also come away impressed by the toughness the younger athletes on the tour are demonstrating. LEFT: Hancock comfortable in his surroundings. RIGHT: NMU/OTS frosh Tommy Brackett (87 kg) works a gutwrench while Hancock battles in the background. RIGHT: 2017 Cadet World Champion Cohlton Schultz (130 kg) digging in the trenches; LEFT: Olympian Jesse Thielke (63 kg) feeling for a scoring opportunity. LEFT: Washington product and 2018 Cadet World Team member Dominic Damon (63 kg, red). RIGHT: Patrick Smith controlling his partner’s head. LEFT: Austin Morrow (67 kg, NYAC/OTS, red). RIGHT: Patrick Martinez (87 kg, NYAC). LEFT: Schultz still getting after it. RIGHT: Smith still heavy on the head.